From here candidates can get the details of ESIC Maharashtra UDC Recruitment 2019 for UDC (Upper Division Clerk) posts. Candidates who are very much interested to work in Maharashtra, they can apply for this Employees’ State Insurance Corporation (ESIC) Notification 2019. You can apply for these esic.nic.in UDC Jons 2019 from 16th March 2019 to 15th April 2019. In the below sections, you can get the data such as educational qualification, post-wise vacancies, age limit, salary details, important dates, set of instructions of to apply for the ESIC Maharashtra UDC Recruitment 2019, and others. The higher authorities of released the ESIC Maharashtra Stenographer Recruitment 2019 notification to fill the 25 Stenographer posts. In the sections, gather the complete information on कर्मचारी राज्य बीमा निगम Openings 2019, and apply from 16th March 2019 to 15th April 2019. For more details Age Limit, set of instructions to apply, Educational Qualification, Selection Process, Application Fee, PayScale, and even the details of important dates to apply for ESIC Steno Jobs 2019. In the below sections, applicants can get data on Post-Wise Vacancies For www.esic.nic.in Jobs 2019 along with their count. Candidates who are ready to apply for the UDC (Upper Division Clerk) & Stenographer Posts, they must and should have to check this educational qualification for ESIC Maharashtra UDC Recruitment 2019. A speed of 80 Words per minute in Stenographer in Hindi/ English. NOTE: Candidate who had not acquired/will not acquire the educational qualification as on the closing date of receipt of online application will not be eligible and need not apply. After checking the details of educational qualifications, every candidate for the UDC (Upper Division Clerk) & Stenographer Posts have to check the age limit for ESIC Maharashtra UDC Recruitment 2019. 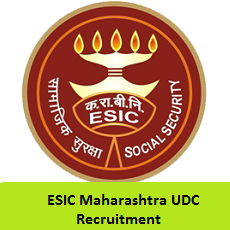 The higher authorities of Employees’ State Insurance Corporation (ESIC) Maharashtra had announced the Selection Process For Employees’ State Insurance Corporation (ESIC) Vacancies 2019 of UDC (Upper Division Clerk) & Stenographer Posts. Candidates who had got selected in the ESIC Bihar UDC Recruitment 2019, they will get the pay as per the rules and regulations of the Employees’ State Insurance Corporation (ESIC) organization. Candidates can visit Sarkari Naukri for more updates. Revised pay as per 7th Central Pay Commission for the post is Level- 4 of Pay Matrix (Civilian employees) with Entry Pay Rs. 25500/-, replaced against Pay Band Rs. 5200 – 20200/- with Grade Pay Rs. 2400/- of 6th Central Pay Commission. * This fee of Rs. 250/- shall be refunded duly deducting Bank Charges as applicable, on appearing of the candidate in the Phase – I Written Examination. NOTE: Bank Transaction Charges will be borne by the candidate. Candidates have to visit the official site of Employees’ State Insurance Corporation (ESIC) that is esic.nic.in. In that Go to the Recruitment section which is at top of the home page. Search for the red flashing link of ESIC Maharashtra UDC Recruitment 2019 link. Download and read the complete details in the notification. After that, if you are eligible, then apply for the ESIC Maharashtra UDC Recruitment 2019. Fill the details in the application form correctly. Take the hard copy of application form for further reference.